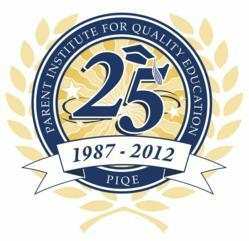 Parent Institute of Quality Education Commemorates a quarter century of proven and tested parent engagement by announcing the ‘sponsor-a-parent campaign’. By recognizing the crippling blow that state wide cuts in educational budgets will have on our children’s futures, PIQE vows to work harder to prepare our parents to advocate for their children’s success. More than ever, the low cost PIQE solution through its nationally recognized nine-week parent engagement program is critical for the success of students. The Parent Institute for Quality Education [PIQE] is celebrating a quarter century of empowering parents, “We are 25-years strong and commemorating our work by launching the silver anniversary sponsor-a-parent campaign,“ said David Valladolid, President & CEO of PIQE, “...for $200 the public can sponsor a parent for our signature 9 week parent engagement program, and be a part of transforming lives,” concluded Valladolid. The nationally recognized PIQE program is known for its work chiefly among 36 of California’s 58 counties with phenomenal accomplishments including graduating more than 500,000 parents over the last 25 years, and enhancing the educational experience and outcomes of more than 1.5 million students. Research shows that among Latino families who participated in PIQE’s Parent Engagement in Education Program 93% of students graduated from high school, in contrast to a dropout rate of 50% for other Latino students. Of those graduating students, 79.2% enrolled in college following high school graduation. Parent engagement in education is the most effective way to improve the lives of children and end the cycle of poverty, reduce crime, and help rebuild communities. According to a study by McKinsey & Co, by eight grade more than 40% of African American and Hispanic students will score ‘below basic’ for math and reading and nearly 50% will drop out of high school. Those who drop out will be five to eight times more likely to go to prison, and will earn 40% less than a college graduate. PIQE’s goal is to reverse this alarming trend. By recognizing the crippling blow that state wide cuts in educational budgets will have on our children’s futures, PIQE vows to work harder to prepare our parents to advocate for their children’s success. More than ever, the low cost PIQE solution through its nationally recognized nine-week parent engagement program is critical for the success of students. In 2004, a longitudinal study by San Diego State University, found that 93% of the PIQE students graduated from high school versus the current Latino graduation rate of 50+% and 79.2% of the PIQE high school graduates enrolled in college versus the Latino College bound rate of 52% in San Diego. In 2011, Cal-PASS examined PIQE’s parent engagement in Central California indicating that PIQE students are enrolling in post secondary institutions at higher levels than comparison students. Since its inception in 1987, PIQE has graduated more than 500,000 parents. PIQE has enhanced the education of more than 1.5 million students. PIQE Graduates over 30,000 parents from its Parent Engagement in Education Program each year. PIQE Serves over 500 K-12 schools in California each year. PIQE works in 36 of California’s 58 counties. PIQE delivers its Parent Engagement in Education Program in 16 languages. PIQE’s MISSION is committed to connecting families, schools and community as partners to advance the education of every child through parent engagement. PIQE is a California statewide and national 501(c) (3) community-based organization dedicated to innovative educational reform by informing and motivating low-income and immigrant parents to become knowledgeable about how to navigate the school system and seek the educational opportunities available for their children.